One afternoon the week before last, I picked up the telephone to answer a call from a 17-year-old Canadian. His name is Felix Auger-Aliassime. He has been causing quite a stir on the ATP World Tour. This remarkable fellow has won a pair of Challenger titles in 2017, establishing himself as the second youngest player to secure multiple Challenger tournament victories. Only Richard Gasquet in 2003 realized that feat at a younger age. The 6'3" teenager is breaking down all kinds of age barriers. He currently resides at No. 161 in the world, and is the youngest to crack the top 200 in the Emirates ATP Rankings since Rafael Nadal, who did so back in 2002. The statistical achievements for this immensely ambitious performer are almost endless. He currently is the youngest member of the top 200. He is the fourth youngest in the last twenty years to make a top 200 debut, standing behind only the distinguished trio of Gasquet (16 years, one month in 2002), Nadal (16 years, 6 months in 2002), and Lleyton Hewitt (16 years, 10 months in 1998). Felix is the first player born since 2000 to earn an Emirates ATP Ranking point, and the youngest to win a match on the ATP Challenger Tour, getting that done in Granby, Canada when he was 14 years and eleven months old back in 2015. At the outset of our conversation, I asked Auger-Aliassime how he felt about living just outside the top 160 at his tender age. Would he have believed this was possible if someone had predicted it would happen a year ago? "It's unbelievable how quick it has been this last year [for me]," says Auger-Aliassime. "In November of 2016 I was winning my first Futures title and now here I am with two Challengers titles. That happens only when the level is there and the head is straight. I keep learning about myself by playing matches at a different level on the pro circuit. Now, whenever I step on the court, I can relate to situations I have been in before. That makes a huge difference. I have played a lot of matches this year and physically I have done a lot of improvements in the last off season. Throughout this year I have made a huge effort and that is just paying off right now, not just physically but mentally as well." Yet this competitor of growing potential had to confront an injury in the middle of the 2017 season that might have discouraged a less resilient individual. Auger-Aliassime explains, "I had a left wrist injury throughout the month of July and August. My first tournament back was the U.S. Open qualifying. I was wearing a cast and I had a little fracture in my left wrist so it all came down to conditioning and strengthening the wrist. I made a few technical changes in my backhand. It improved a lot." What did he do to enhance his two-handed backhand? Auger-Aliassime responds, "I made the swing more simple. Now my backhand is technically more solid with less movement with my wrist. The follow through is better than it was before so I am able to find a better angle and I can get better depth on my ball when I need it." When he returned from the wrist ailment, he did not have much time to prepare himself for the U.S. Open qualifying, but was not displeased with his performance. "I played not bad actually for my first tournament back. I didn't have any expectations coming back. I didn't know what my level was going to be. I kind of lost track also of the level of the other players. This was my first qualifying for a Grand Slam event so I just went out there and followed the guidelines of my coaches. I lost to [Sergiy] Stakhovsky in the second round in two tight sets [7-6 (8), 6-4]. After that I went straight to Europe to get back into competition. I wasn't playing my best but I was hanging in there mentally. I have made such great efforts mentally since I came back from the injury and it has paid off as I won my second Challengers title." The first was at Lyon, France in June, but more on that later. 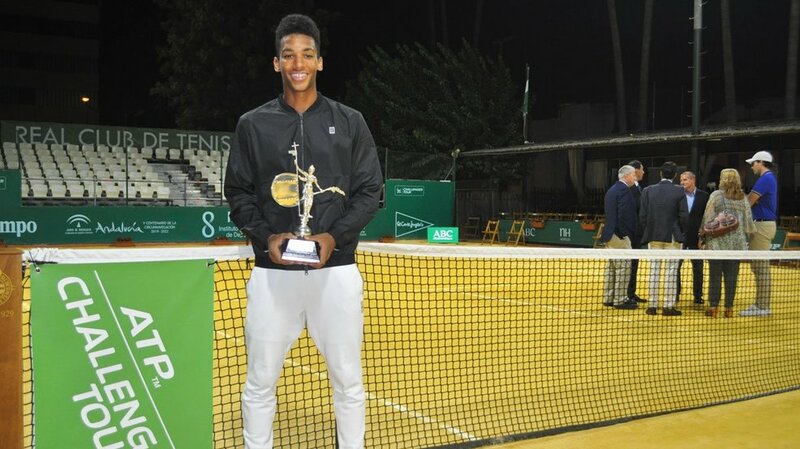 Auger-Aliassime comments initially on his more recent triumph in Seville, Spain. It was a week which was indicative of his entire 2017 season thus far. Unwavering, driven by a need to succeed that probably bordered on obsessive, full of clarity about what it would take to capture a title he wanted wholeheartedly, Auger-Aliassime assiduously went to work. Ultimately, he took the title after a lot of hard work, some good fortune and a few anxious moments. He narrowly survived a harrowing skirmish with Maxime Janvier in the opening round, prevailing 6-2, 5-7, 7-6 (3). After taking his next two contests in straight sets, he found himself in a treacherous corner against Filip Krajinovic. In that penultimate round encounter, he lost the first set and was taken into a second set tie-break. But he came through 3-6, 7-6 (4), 6-3, and then rallied once more in the final, upending Inigo Cervantes 6-7 (4), 6-3, 6-3 to claim the title. "I saw a little bit of everything that week," says Auger-Aliassime. "The week before, I lost second round. I had lost two second rounds in a row and was a bit disappointed. I came into Seville really motivated from the first day. I couldn't play my best in the first round but mentally I made a huge effort to win the third set tie-breaker. That kind of loosened me up and I played really well in the next two matches. I knew in the semis and final it would get tougher and tougher, and it did. It was all about staying positive and not showing any negativity. It was a bit of luck and a bit of mental strength that made it go my way in the semis. Eventually I played my best level in the third set. It just proves how far I have come in maybe one year or a year-and-a-half. That was the kind of match I would have lost last year. In the final, I was down a set and behind 3-0 and one service break in the second set. I just hung in there, gave it everything I had, took it a point at a time and eventually it went my way." Before the wrist became a serious hindrance, Auger-Aliassime took his first Challenger crown in Lyon. How does he assess what that victory meant for his morale and his outlook? "It was a good reference," says Auger-Aliassime. "I think the Lyon Challenger was a huge step for me in winning my first Challenger. It was one of my goals this year. I knew I could do something in Lyon. My ranking wasn't good enough for me to get in but I had a chance as a wildcard. I had a couple of tough matches to start and then it kind of loosened me up for the end of the tournament and I played some of my best tennis of this year at the end of that Lyon Challenger." Asked to compare his two tournament triumphs in Challenger events, he replied, "I would say Seville was even more satisfying because I didn't really have much confidence coming into the tournament. It was my third tournament coming back from the injury, but I was able to deal with all of those situations and all kinds of opponents. I was probably more proud of that achievement than I was about winning Lyon because it was a tough couple of months with the wrist injury. After all of that frustration, being able to bounce back and win a title was something great for me. Lyon was my first Challenger win so you never forget that as you are trying to go up in the rankings and you are feeling all kinds of emotions, but Seville made me even more proud." In 2016, Auger-Aliassime was toppled in the final of the French Open juniors, garnering three match points against Geoffrey Blancaneaux before suffering a bruising 1-6, 6-3, 8-6 loss. It was a defeat that could have left a lasting scar on his psyche. But this kid of strong stock was different. "I kind of have mixed emotions looking at that final," he says. "It was my first final at a Grand Slam and a tournament I always dreamt of playing when I was a kid. Obviously, it was heartbreaking to lose it. I think it is normal when you lose matches like this one as a junior for it to be really tough, and it was. But then I won the U.S. Open juniors at the end of that summer. When I got to the finals of that tournament, there was no way in my head that I would let this chance pass again. Maybe I would not have won the U.S. Open Juniors if I had not lost the Roland Garros final. After that loss in Paris I was very hungry to win and that made the difference in New York last year." And so Auger-Aliassime has made extraordinary strides over the last couple of seasons, from winning a major junior singles title in 2016 to taking two Challenger championships during the 2017 season, from No. 613 in the ATP Rankings at the end of 2016 to his current location 452 places higher, from relative obscurity to larger recognition. Meanwhile, the talk of Canadian tennis in recent months has been Denis Shapovalov, a dynamic left-hander who resides now at No. 51 in the world. Auger-Aliassime has developed a meaningful friendship with Shapovalov, and has also been inspired and motivated by the success of his countryman. Has Shapovalov made Auger-Aliassime a better player through both example and proximity? "Our friendly rivalry has helped us to push each other," says Auger-Aliassime, who captured the U.S. Open Junior doubles title alongside Shapovalov in 2015. "I think Denis is obviously a great model not just for me but for all young Canadian players. What he has done so far is unbelievable. He is my best friend outside of tennis. He sets a good example for me but tennis is a singular sport and everyone has a different path. Denis and I are in competition on court but it is a healthy rivalry and that is what pushes us to become better because, at the end of the day, outside of tennis we are both really close friends. We are like family to each other. But once we step on court either in practice or in matches, it is really great competition. I hope it will just stay healthy like it is now and we will push each other to the highest levels." I wanted to know if he spoke with Shapovalov after his friend stopped Nadal on his way to the semifinals of Montreal this past summer, or after Shapovalov reached the fourth round at the U.S.Open. Does Shapovalov share his thoughts about experiences of that significance with Felix? "We do talk," says Auger-Aliassime. "We not only talk about our careers but we just talk about tennis and what we think about the circuit and other players. We both are really passionate about our job. Denis and I like talking about the game and he is really encouraging in my career and really supportive even though we are in competition. He really wants the best for me, and I want the best for him." Earlier this year, in the semifinals of a Challenger event in Drummondville, Canada, Shapovalov defeated Auger-Aliassime 7-5, 6-3. It was their first of what will surely be many meetings between these two ambitious competitors. "We have played before in the juniors," reflects Auger-Aliassime, "but this was the first time we played on the pro circuit. It is not easy to play your best friend, even though you want to put that on the side once you step on the court. We both played a good match, but at the time his level was probably better than mine. It was frustrating for me, not just the fact that I lost to him but because I was so close then to winning my first Challenger title. He kind of stopped that. At the end, he was a better player than me that day. We both have our careers and I am not trying to compare myself to Denis. Denis doesn't try to compare himself to me. We just try to keep pushing each other to become better. It is all healthy." Auger-Aliassime believes he has grown up considerably in many ways over the last year. His temperament has become more of an asset. His maturation is readily apparent to those who have watched him for a long time. He is steadily evolving. "Probably one of the biggest differences in me," he says, "is the mental aspect of my game. I am really more composed now than I was last year. I am always making adjustments and every tough and heartbreaking loss is a chance for me to get better. What I have done really well over the last year or two is to take all of my losses and turn them into positives. That makes a huge difference." That Auger-Aliassime is a tennis player at all is surprising. Growing up in Canada, he might conceivably have turned to ice hockey player in such a cold climate. And yet, for him it was completely tennis from the time he started. "I was probably kind of born with a tennis racket in my hand," he says. "I didn't really think of any other sports. My Dad [Sam Aliassime] is a tennis coach and he introduced me to tennis at a very young age. I can't even remember how old I was, probably three or four years old. I had the passion for it from the beginning and I never thought of doing anything else. I always told my parents I wanted to be a professional tennis player and now here I am going up in the rankings." His father's role must not be minimized. As Auger-Aliassime explains, "My Dad is an immigrant from West Africa. As soon as he arrived in Montreal, he started coaching in clubs and he got hired in a few of those clubs. Eventually he got hired in a good academy in Quebec City and that is where my Dad still coaches. So that was where we started together. That was the beginning. I never wanted to leave the court. Now that this is my job I am just enjoying what I am doing. It is really a dream come true." His Dad no longer coaches Felix. "He doesn't travel with me anymore. I am with two coaches, Guillaume Marx and Frederic Fontang. They alternate. At the end of the day they complete each other and make me a better player. My Dad and I don't talk about tennis that much. He is kind of more of a Dad to me now than a tennis coach so we talk some about tennis but not necessarily about my career. He knows his limits and is happy with what he is doing now. It is better for our relationship this way." Meanwhile, his mother, Marie Auger, has been a pillar by his side. "She has played a huge role in my life. She is a school teacher so she has done a great job on the education part and is making sure I am on the right path and helping to make sure I keep my head on my shoulders. She really keeps me grounded. She is the perfect Mom in my situation and even though she has never played tennis she is really supportive and understands her role as a Mom in the tennis world. I want to keep doing something else after my tennis career so that is my objective—to finish my school [requirements]. I will probably be done next May but I want to keep learning so I will see where I am. My Mom has been great." Meanwhile, as he pursues his tennis education as a young player improving by leaps and bounds, Auger-Aliassime still has an outside chance to qualify for the season-ending Next Gen ATP Finals in Milan, an elite event for only eight highly accomplished 21-and-under players. Currently Auger-Aliassime is No. 19 in the standings, but a stirring finish to the 2017 season might enable him to qualify for the eight-player field. "I would probably have to win a few more Challenger events for that to happen," he concedes, "but who knows? We can't predict the future but if I don't make it to Milan, that is not a problem. Right now I am going to California for three Challengers and then off to qualifying for the ATP World Tour 500 event in Basel. Then I will finish off the year with one or two more Challengers. You never know. I will try my best to make it to Milan." Auger-Aliassime was soundly beaten in the opening round of the first California Challenger he played last week at Tiburon, losing 6-2, 6-2 to world No. 708 Deiton Baughman. But arduous losses happen to everyone. Looking at the long term future, Felix Auger-Aliassime speaks effusively about what he envisions for himself in the years ahead. Does he look into the eye of his mind and see himself winning Grand Slam tournaments? He says, "Since I was a kid I have always wanted to play on the big stages, play in the final of Grand Slams, be a constant player in the top ten, and reach the No. 1 spot. These are all objectives that motivate me to train every day. It is the kind of thing that you live for, to play these big events and be part of an elite group of players."